If you just got a retainer, or are wearing an Invisalign - type aligner, we offer several convenient products to help you keep your dental appliance clean and germ free. Remember to clean your retainer every night to prevent white plaque build-up (which can ruin your retainer) and banish embarrassing odors caused by bacteria! The following products can be used for retainers, clear aligners, sports mouthguards, bruxism devices, snoring devices, and all other types of removable dental appliances, including dentures! 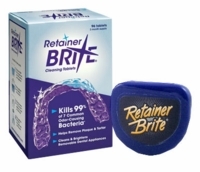 Retainer Brite is an effervescing tablet which cleans your retainers in 15 minutes. You can additionally purchase a Cordless Sonic Cleaner to use with Retainer Brite. SonicBrite is a kit that comes with its own powerful cordless sonic cleaner, which has an automatic shut-off. Use one measuring spoon of SonicBrite powder in the sonic cleaner to get your retainer free of germs and odors in 15 minutes. 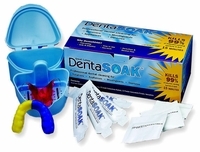 DentaSoak is a cold-water solution for cleaning retainers. It does not contain Persulfate. It also cleans your retainers in 15 minutes. You mix one batch of DentaSoak and use if for an entire week. Cleanse, Freshen, Go is a Persulfate-Free cleaner which comes in a spray or in handy towelettes, which are great for cleaning Invisalign or any removable dental appliance.